Within the business world each person has to continuously make choices related to ethics. It is an everyday part of life. 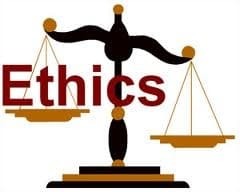 In many fields ranging from the practice of law to engineering services there are codes of ethics to which people must adhere. In order to receive the professional license in a given field, individuals must sign the code stating they are willing to abide by its ethical standards. As part of the codes, they state how people should and should not behave on matters of ethics. They also state in many cases that a failure to adhere to the code will result in the revocation of the license. As important as ethics are, there is no business code of ethics that must be signed in order to enter management. In order to be a manager, one does not have to sign a paper stating they will follow specific standards for the rest of their career. There is not a code of ethics for managers that must be signed prior to entering the management arena. Although most corporations have their own set of company policies and procedures, there is not a set standard through the business world. In the past few years, there have been several scandals that have come to light where CEOs or other high ranking officials in the business world have been caught doing things that most people consider to be unethical. Should leaders be held to an ethical code of conduct that they would have to sign? What should be on the code of ethics? What should the penalties be for not following the code of ethics? Please give me your feedback in my comments section below. I will be using your feedback for future posts.